Born Alice Ericson, on 16 Feb 1909 in Concord, New Hampshire, the daughter of Finnish immigrants. Alice’s father worked as a granite cutter in Concord’s granite quarry. She pursued an early interest in art, enrolling in the Museum of Fine Arts in Boston, MA in 1925. Finishing her studies in 1929, she married another artist, Roland Cosgrove. She worked at various jobs and in 1946 was employed by the Planning and Development Commission of New Hampshire. While there she created a boyish cartoon character called “Chippa Granite” which was used to promote tourism and agriculture in New Hampshire. The book, “New Hampshire Notables,” provides a biography thusly: Educated Concord High School, School of Museum of Fine Arts, Boston, Mass; artist of N.H. State Planning and Development Commission; designer of N.H. Marine Memorial planned at Hampton Beach, N.H.; creator of ‘Chippa Granite’ (used extensively in New Hampshire State advertising); murals at Way School, Claremont, N.H.; commemorative portraits of the late George M. Putnam, and others. She was a member of N.H. Art Association. Congregationalist. She resided at 11 Tenney Street, Concord, New Hampshire. 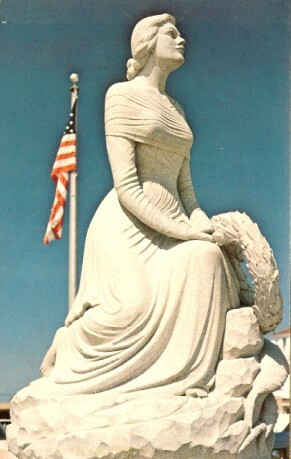 Possibly her most memorable creation was the drawing for the sculpture at the New Hampshire Marine Memorial at Hampton Beach, New Hampshire. 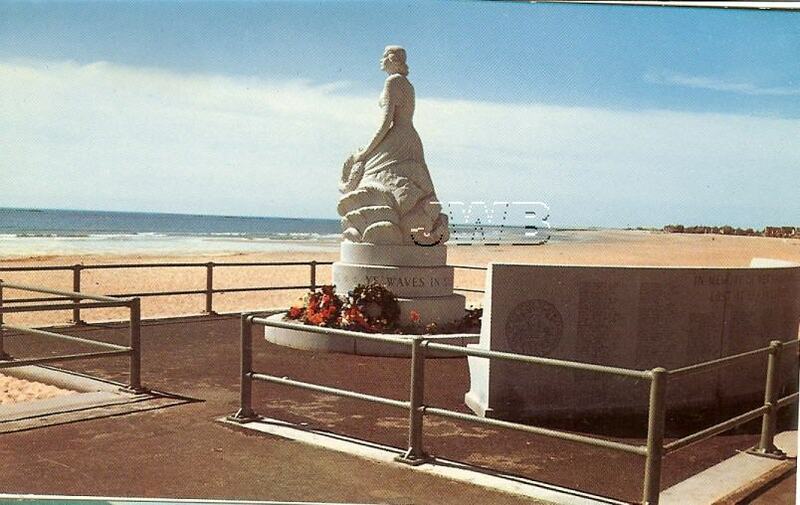 This memorial is of a beautiful, “Gold Star Mother” gazing over the waves, and reverently laying a wreath upon the waters of the cold Atlantic, a reminder of the soldiers and sailors who have been lost at sea in defense of their country. “Massachusetts sculptor, Teodors Uzarin modeled a life-size statue, in clay at the Caproni Galleries in Boston. Vermont artisan, Vincenzo Andreani, using the clay model as a guide, carved the statue. [Note: the original idea for a memorial came from William E. Downs of Manchester who wanted a grave marker for his son, Capt. William D. Downs who was buried at sea on May 25, 1945]. Alice Ericson Cosgrove died 7 December 1971. Some of her papers can be found in UNH’s Milne Collection. Vintage Postcard of New Hampshire Marine Memorial at Hampton Beach. Eric Ericson, was born December 1872 in Finland He immigrated to the United States about 1889 and worked as a Granite cutter in Concord, New Hampshire, He married about 1893 to J. Sophia Granholm. She was born July 1874 in Finland, and emigrated to the United States about 1892. She died after 1950. 1. Ida Ericson, b. 9 Nov 1894 in Concord NH, died Feb 1968 in Concord NH; did not marry; in 1930 in Cambridge MA, a bookkeeper for a garter factory; with her sister Hulda ran the Ericson Convalescent Home in Concord NH. 2. Huldah Ericson, b. June 1896 in NH; did not marry; with her sister Ida ran the Ericson Convalescent Home in Concord NH; In 1960 Hulda and Ida S. res 446 N. State Street. 3. Hugo Edward Ericson, b. 13 Jan 1898 in NH; living in 1917 when he completed his WWI draft registration form. 4. Henry H. aka Harold Henry Ericson, b. 29 Dec 1899 in NH; in 1917 was a draftman in the U.S. Navy Yard of Portsmouth NH, and residing 107 Vaughn Street Portsmouth, when he completed his WWI Draft form. 5. Paul E. Ericson, b. 18 Jul 1903 in Concord, NH, and died Dec 1978 in Concord NH. He married Helen A. –. She b abt 1908 in NH. For a time Paul was a clerk at Concord Electric Company and resided on Lakeview Drive in Concord [Penacook]. They had a daughter, Betty J. born about 1928 in NH. In the 1950 Concord directory, Betty Jane Ericson is shown as a bateriologist living in Syracuse NY. 6. *Alice D. Ericson, b. 16 Dec 1909 in Concord, New Hampshire; she died December 1971 in Concord NH. She married Roland “Roy” Cosgrove, son of Daniel J. & Mary (Roland) Cosgrove of Cambridge MA. He was b. 9 August 1900 in Cambridge MA and d. 20 July 1968 in Cambridge MA. The 1926 Directory of Quincy MA shows Roland D. Cosgrove living at 1 Lenox Street, an artist. His father was a letter carrier in Cambridge MA. In 1933 Alice Cosgrove (the directory says Mrs. Roy) was living at 11 Tenney Street in Concord NH. They had a daughter, Johanna/Joanna Cosgrove, b. 1931, who m. Charles John Collova. Johanna is listed in the 1950 directory of Concord as a student living with her mother. Charles J. & Joanna (Cosgrove) resided in Burlington VT and had two children: (1) John Eric Collova, b. 22 May 1951 Burlington VT and d. 16 November 1956 (Boston Herald obituary); (2) Stephanie Jane Collova, who m. — Bunton and was residing in Herndon, VA. This entry was posted in New Hampshire Women and tagged Alice, artist, Atlantic, Ericson Cosgrove, gold star mother, Hampshire, Hampton, lady, Lady of the Sea, lost, Lost At Sea, marine, memorial, merchant marine, MIA, missing, new, NH, ocean, sailor, sea, soldier, wreath, WWI, WWII. Bookmark the permalink.